Form-Based Codes are an alternative to Euclidean zoning, which focus on the creation, revitalization, and preservation of vibrant, walkable urban places. Elizabeth Plater-Zyberk states in Form-Based Codes, “as Global Society swings into action to reduce carbon emissions, the data ever more clearly points to the need to reduce dependence on vehicular mobility and to remake the built environment as transit- and pedestrian-friendly places of dense economic and social interaction. Only the form-based code can ensure such an urbanism.” Form-based codes regulate development in a manner that uses physical form, rather than a separation of uses. This Code posits itself in the paradox already at play in the Central West End between old versus new, tall versus short, and historic versus contemporary. 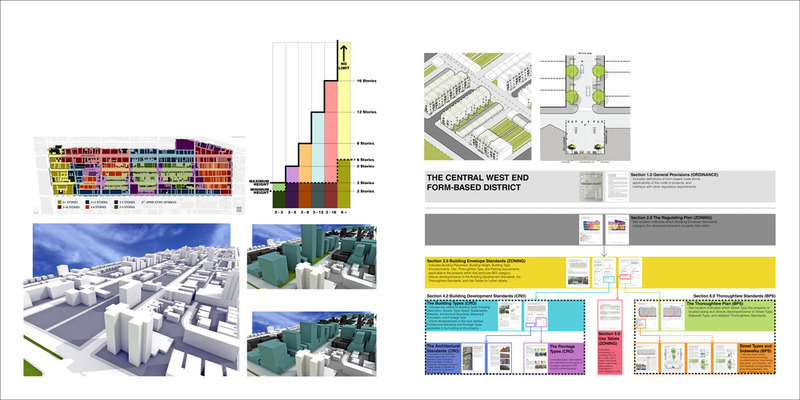 The Form-Based District includes a regulating plan, building envelope standards, and building development standards. It allows for more urban, environmentally friendly, and culturally sensitive zoning within the area; while ensuring an increased density of new residents. This district is the enabling legislation that ensures that the sustainable vision developed by community residents is achievable by right rather than by variance. The City of St. Louis boasts all of the best qualities of textured Midwestern construction, eastern urbanism, and landscape-driven morphology, many qualities of which are considered by many as second-to-none. This character is exhibited in the great neighborhoods, excellent parks, and diverse commercial districts throughout the City. The Central West End Community is no stranger to distinctive urban character, and the fifty thousand residents of the area have a vested interest to preserve this urban character for the social, economic, and environmental benefit of the Community. This code was constructed specifically to foster new development befitting of this rich history and character, and in support of the public objective. 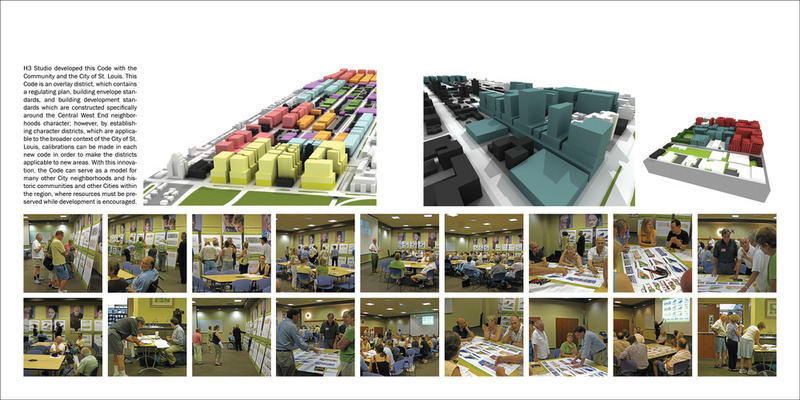 H3 Studio developed this Code with the Community and the City of St. Louis. This Code is an overlay district, which contains a regulating plan, building envelope standards, and building development standards which are constructed specifically around the Central West End neighborhoods character; however, by establishing character districts, which are applicable to the broader context of the City of St. Louis, calibrations can be made in each new code in order to make the districts applicable to new areas. With this innovation, the Code can serve as a model for many other City neighborhoods and historic communities and other Cities within the region, where resources must be preserved while development is encouraged. This process was initiated in response to growing concerns from the community arising around inappropriately formed and scaled development, most specifically related to the historic core of the neighborhood, which contains a number of historic resources. This under-utilized portion of the neighborhood is essentially landlocked on the north by a well-established area of the same neighborhood, on the east by an expanding university, on the south by two major medical and research institutions, and on the west by the regionally significant Forest Park. With little direction other than inward for this development pressure to go, the project highlights the need to build out the density of the area in a well thought out manner and utilize the sixty-six available parcels to their maximum potential.